Cardiovascular Perfusion and Nursing publishes original articles on topics in cardiovascular surgery, cardiovascular perfusion and nursing care. These encompass all relevant clinical, surgical and laboratory studies, editorials, current and collective reviews, technical know-how papers, case reports, interesting images, “How to Do It” papers, correspondence and commentary. 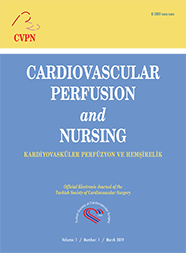 Cardiovascular Perfusion and Nursing is the official journal of the Turkish Society of Cardiovascular Surgery and is funded by this society. It is published three times a year. The policy, content and the format of this journal complies with the requirements (Uniform Requirements for Manuscripts Submitted to Biomedical Journals) of the International Committee of Medical Journal Editors.